The UtterBerry™ System consists of a collection of miniature, artificially intelligent, ultra-low power sensors. These wireless sensors self-calibrate to form a mesh network and relay data between each other, working as a family of sensors in any particular area. They do not require line of sight between each other. For real-time remote access to the sensor data, the sensors are supported by a Base Station providing connectivity to the Internet or Local Network. The UtterBerry™ Smart Sensor is specifically designed for smart infrastructure. This miniature ultra-low power wireless technology provides intelligent Big Data with unrivalled precision. The patented in-built artificial intelligence and machine learning capability enable the UtterBerry™ system to form the core technology required to build Smart Cities and IoT devices. UtterBerry™ operates across a vast number of platforms ranging from Smart Tunnels, Construction, Smart Hospitals, Smart Bridges, Smart Devices, Crowd Sensing, Smart Industry, Smart Agriculture, Smart Trains, Smart Rail and Underground Networks, Smart Buildings and Smart Roads. The UtterBerry™ Smart Sensor System makes is possible for train operators to utilise smart technology within their trains, improving the travel experience of their passengers. This may take the form of real-time monitoring of passenger numbers within each carriage of a train, providing accurate travel information to passengers, and integration of train rolling-stock into a smart rail network. The technology provides real-time data to provide accurate road usage statistics, and to enable adaptive real-time road traffic control, via integration with traffic lights, speed limiting measures and diversion handling. Energy savings are also possible when combined with street lighting, ensuring street lights are only turned on whilst moving vehicles are passing by. Agricultural buildings and machinery can be adapted with UtterBerry™ to enable smarter agriculture. The technology can monitor and control activity throughout agricultural buildings and fields – including usage of lighting, water and energy. It is able to differentiate between livestock and humans, providing both personnel and animal location sensing capability. UtterBerry™ can be utilised within a new or existing hospital, creating a new generation of smart-enabled hospitals. The technology can monitor and control various types of activity throughout a hospital – including usage of lighting, water, energy, elevators, access control, security and fire systems – all of which integrate with staff and patient location sensing capability. UtterBerry™ is working with its partners to provide bespoke mass sensing networks throughout their infrastructure, that enables accurate, real-time data analysis. 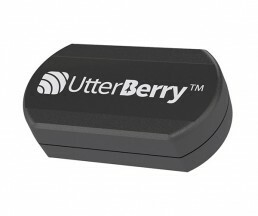 UtterBerry™ Smart Sensor is specifically designed for smart infrastructure, this miniature ultra-low power wireless technology provides intelligent Big data with unrivalled precision.